E120@t is designed for household metering in urban areas, either in apartment buildings or single houses. 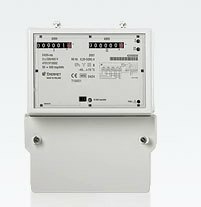 In addition to electricity metering it can be used to gather metering information about gas or water consumption through its S0 inputs. The relay outputs can be used to control different loads like heating. Relays can be controlled by the programmable week calendars, dynamic commands or directly from the AIM system. The meter communicates using the Ethernet network and TCP/IP, an open standard making it possible to use the meter in different metering systems. Multiple input/output options and open communication make the E120@t a flexible and versatile metering tool both now and in the future. E120@t does not only gather electricity-metering information. The S0 inputs can be used to gather metering values to the metering system from other sources, like gas or water meters. The meter has four internal tariff registers that are controlled by a week calendar and can be configured from the system. The meter also monitors and records power quality (over/under voltage), power cuts, alarms and events. All registers and relay status can be read from the system and alarm limits can be set according to needs. The meter also has a cumulative hour series register and three cumulative day series register for electricity and external metering devices. The E120@t integrated meter meets strict environmental requirements. All device parts can be recycled and the packaging is made of recyclable cardboard.